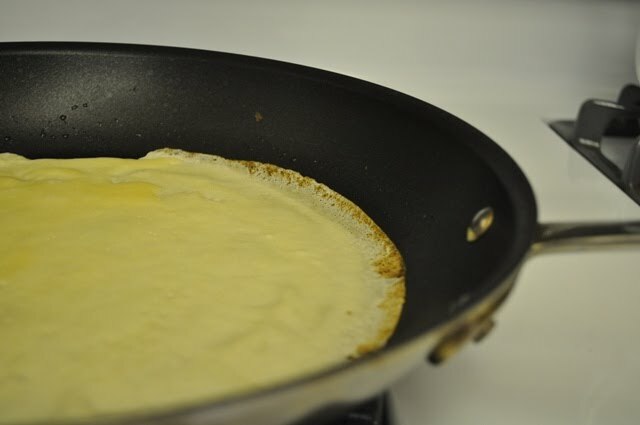 Who knew crepes were so easy to make? If I had known, these would have graced my kitchen a long time ago! This is why I love being a part of Sweet Melissa Sundays--trying new things and going out of my comfort zone. The batter comes together easily. I halved mine and used my mini prep food processor rather than the blender. I used 1/4 cup batter per crepe and it made a total of 6 crepes. A quick swirling motion to coat the bottom of the pan and these little babies cook up in about a minute. 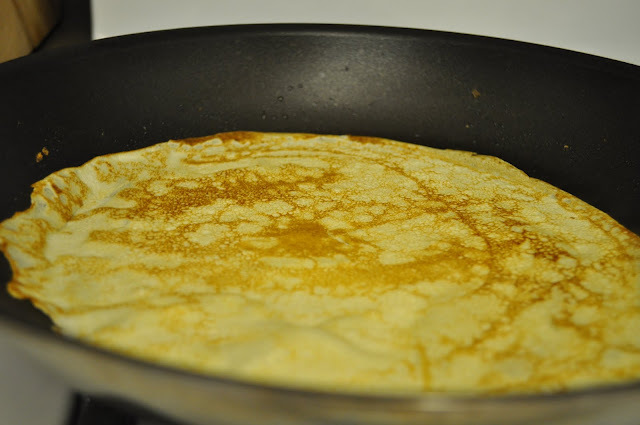 I was a little worried about flipping such large thin "pancakes", but it was really simple. Even if they don't lay down perfectly, just use your spatula to straighten it out...and in less than 30 seconds side number two is done. Easy peasy! Hubby and I fell in love with crepes after a brief to trip to Paris about 7 years ago. They can be found from street food vendors and are served warm and gooey. And my absolute favorite is Nutella with sliced bananas. So that was a given. And, not surprisingly, of the 3 variations I tried, the Nutella with bananas won hands down! 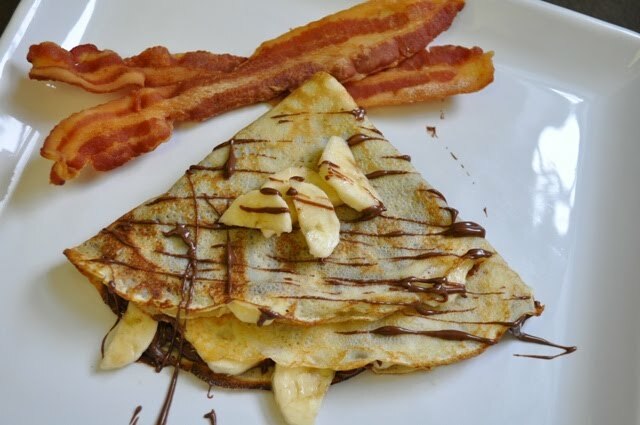 This was breakfast this morning and the crepe went perfectly with 2 crispy slices of bacon. I hear that chocolate covered bacon is all the rage, and now I understand why. My bacon may have slipped into to a bit excess Nutella left on the plate. And it was tasty! The next variation was a simple squeeze of lemon juice and a dusting of powdered sugar. I actually didn't taste this one. Hubby did...he said it was kind of bland (not enough lemon I guess) and the fact that it wasn't warm by the time he got it didn't help. The final version was macerated white peaches with fresh vanilla cinnamon whipped cream. It was good--but didn't have the wow factor that the Nutella/banana combo had. The vanilla cinnamon whipped cream was a nice touch and inspired by SMS baker Nikki from last week's recipe for Sweet Plum Clafoutis with Almonds. Thanks Nikki! I look forward to more crepes...perhaps I'll try savory fillings next time. Thanks so much to Jaime of Good Eats and Sweet Treats for choosing this week's awesome recipe! Check out her site for the recipe. See how other SMS Bakers fared this week. Lovely crepes! I think I will have to try banana and Nutella. I was sitting out this week due to computer problems but looking at everyone's beautiful crepes is making me want to try them out! 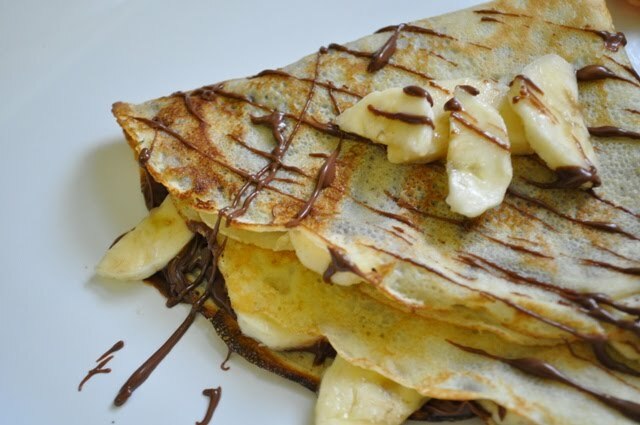 I love crêpes + bananas. I like to put thinly sliced bananas on the crêpes right after you pour the batter into the pan. That way when you flip it, they'll adhere to the batter, and then magic happens. They caramelize when you flip the crêpe. Yum yum! Love all of your variations! Beautiful crepes! All your variations look fantastic! 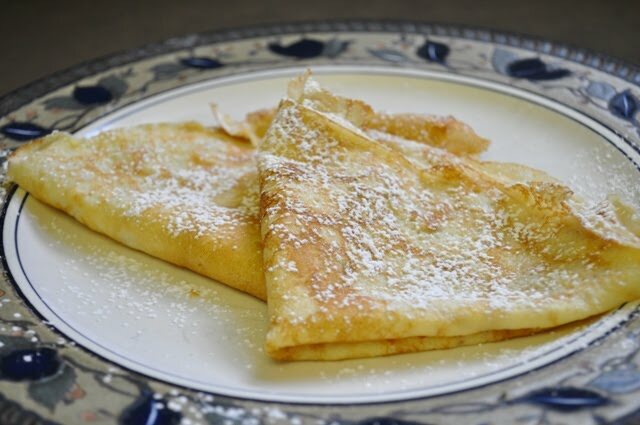 My sister used to order a lemon/sugar crepe at a creperie in San Francisco; I always went for Nutella, though. I was also very happy to find out how easy crepes are, for some reason I always thought they'd be really fragile and difficult. The Secret Baker group is starting up again. If you're interested, send me an email (monstercuisine.margot@gmail.com) and I'll forward your contact information to the hostess. These could not look more incredible. You did an awesome job with them. When can I come and eat all this yummy food. Wonderful combinations for fillings! 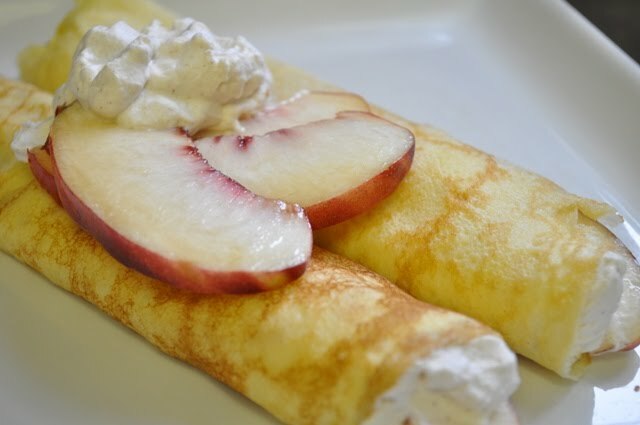 I love how pretty you drizzled Nutella on your first set of crepes and the peaches with cinnamon, vanilla whipped cream looks amazing too. Lemon juice and powdered sugar sounds tasty and I wish I had thought of the lemon flavor because I have leftover homemade lemon curd to use up and all I would have had to do was leave a few crepes for breakfast. Live and learn =). Chocolate covered bacon would have to seriously grow on me but I am always game to try the first time! I have to try these! Nutella would be my favorite as well (though I like the sounds of your lemon crepe).